Our November tile workshop series will have you seeing stars. 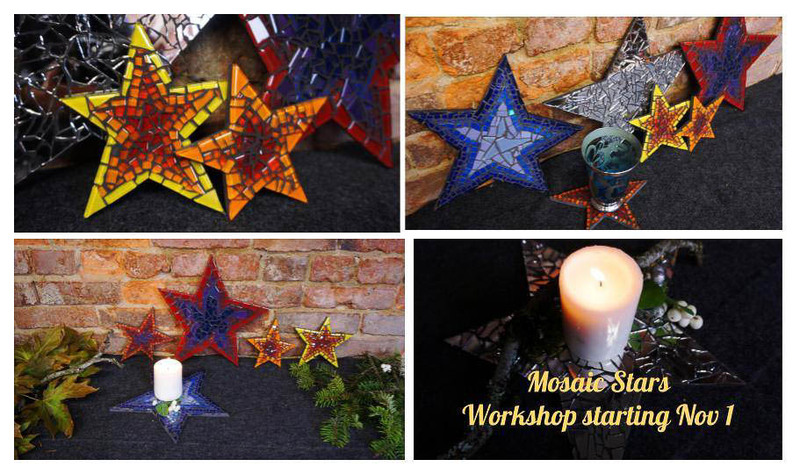 Join Debbie Dickinson of Possibilities in Tile for a fun and festive star themed mosaic workshop. This class teaches you a few techniques for working with glass and ceramic tiles. You will learn design basics as you create a mosaic using a simple indirect application method. Leave the completed mosaic with us to do the grouting and come back later to pick up your completed masterpiece! Use your mosaic star as a candle stand, coaster, trivet, or hang it on your wall. And of course, these stars will make fun gifts. There are six class times for the star series, all occurring at 6PM at 932 N State St, Bellingham, 98225. The dates are as follows: November 1, 4, 6, 8, 13, & 15. Each class has a 15 person limit, and a 4 person minimum. Sign up soon, this new workshop series is filling up fast. There are multiple classes a week, so find a friend, pick a time and get ready to create. This fun new workshop series is a partnership between The RE Store and Debbie Dickinson, a local mosaic artist, specializing in original handcrafted tile murals and special installations. Debbie first learned her craft while working in the building industry, and is dedicated to sustainability, using discarded and salvaged tile and stone when possible. Learn more on Facebook and register by visiting Debbie’s website.